Korean brand Tosowoong has been releasing limited edition Makeon Princess Gel Liner sets in seriously cute tin packaging, over the last couple of years. The first set had a mermaid-themed packaging and the liners were pearly while the second season's offering came with smoky eyeliners. This year's Season III set of Tosowoong Makeon Princess Limited Edition Bronze Spectrum Waterproof Gel Liners - costing just $8.77 - comes in Cleopatra-themed packaging and the liners are bronze-centric. For new entrants into the world of Korean cosmetics, Tosowoong is a skincare giant whose Dr Troubex range gets my contrary, obstinate, badly-behaved skin out of troubles. Makeon Princess is their gel pencil liner range and they have had three limited edition sets out so far. 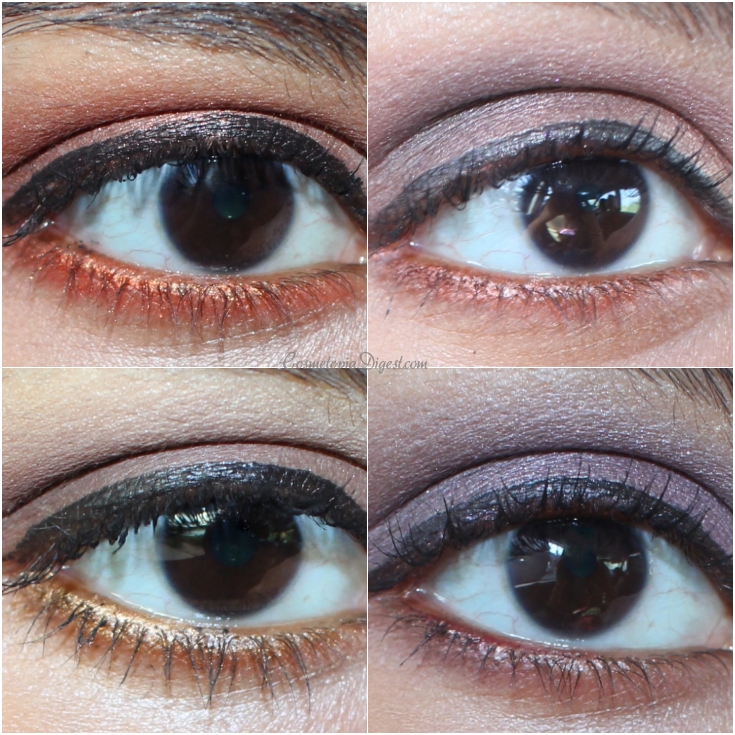 Scroll down for the review, swatches and eye makeup looks with Tosowoong Makeon Princess Limited Edition Bronze Spectrum Waterproof Gel Liners Season III. Season I's tin was a cute pink with a mermaid, which I got in Memebox's Superbox II - see unboxing here. Season II (which I don't have) featured a blue tin. The third edition (PR Sample) has a gold tin with cartoon Cleopatra herself - albeit with a tiny nose - gracing the lid. I love the Egyptian theme. Formula-wise, these are among the best pencil formulations I've come across. They are creamy and pigmented and boy, do they stay on! You have to hit them with Bi-Facil for them to come off. Which makes them brilliant for smudging on the waterline. They "set" quickly, so if you want to smudge, you would have to work fast. I prefer smudging with a fingertip. Also, these don't need sharpening - score! I love these for smudging on the waterline. You get thin lines, but I prefer applying them thickly and lightly smudging with a finger. The bronzey colour scheme for Season III makes these great for the Summer. These are a tad dressy so you might want to keep them for special occasions or nights out rather than work. You can buy the Makeon Princess Gel Eyeliner Set on Roserosehop here for a paltry $8.77. They ship worldwide. Which is your favourite pencil eyeliner brand? Tell me in the Disqus comments widget below.